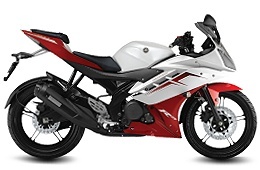 The Yamaha YZF-R15 version 2.0 is a 2013 update for the reasonably cheap 150cc sports motorcycle. The update claims to include performance and has more obvious cosmetic upgrades. The most notable change is to the exhaust design which does look better proportioned and includes aluminum swing arm, wider tyres (R130-70-17) and LED headlights and redesign rear end are of note. The YZF-R15 is sold in various heavily crowded developing countries which means you will be getting a reliable motorcycle. This is because I do believe the rumour that only motorcycles that can go un-serviced for 2 years are only sold in that part of the world. These models are regarded as top of the range models in these markets as well! In this part of the world the YZF-R15 is considered and targeted to commuters and learner motorcyclists which is perfect since it’s cheap to buy and run. The Yamaha’s power will not overwhelm your reflexes even with its cheap tyres and suspension setup. The YZF-R15’s version 2 updated exterior design is still current and the build quality is pretty good too. Unfortunately there is nothing to excite the senses or complain at all in respect to the physical motorcycle. I guess that is exactly what Yamaha want to do with this particular model! The engine has only a single cylinder that straddles the 125-250cc gap but the higher capacity by a mere 25cc does balance out the older technology compared to the latest 125cc models. Since I haven’t ridden one yet I can only assume that is goes well for this sort of motorcycle. The only problem with the YZF-R15 version 2’s improvements have not made it standout in a very crowded class. However with the same price tag of Approx $3999 it does help would be purchasers make up their mind. Like the prior model it is an inoffensive motorcycle and just as good as those with 250cc especially in city traffic.